Any Man vs. Wild fans around????? You are going to love this new show with Bear Grylls! This new reality show is hosted and lead by Bear Grylls. Watch as 10 teams of 2 practice their survivalist skills! 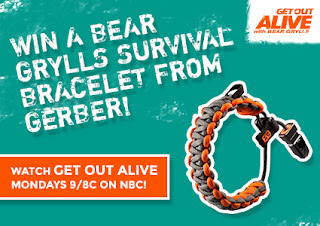 This Bear Grylls survival bracelet from Gerber features 12 feet of high-strength paracord to help you work your way out of a difficult situation. Weighing less than an ounce, it has an easy, one-hand size adjustment and an integrated whistle. I'm a Grizzly Bear. You’d definitely get out alive! Bear Grylls would be proud. You immediately know exactly what to do in every outdoors situation. Raise your paw and give us a high five! Favorite gif is eating the grubs. Bear Climbing down the rock! I like the high five gif best! Grizzly bear. LOL! I think that's a stretch! I am a grizzly bear!!!! I received my bracelet and love it THANK YOU for hosting this great giveaway.